If you wish to receive occasional emails containing news and information about Real Estate Investors PLC, simply complete the short form below. You may un-subscribe from this service at any time. Your email address will only be used by REI to send these news updates, and will not be disclosed to any third parties. Formed in 2004, REI Plc is a publicly quoted property investment company with a portfolio of over £200 million in commercial and residential properties, diversified by property type and occupier with a geographical focus on Birmingham and the Midlands. On 1st January 2015, REI Plc converted to a Real Estate Investment Trust (REIT). Real Estate Investment Trusts are listed property investment companies or groups not liable to corporation tax on their rental income or capital gains from their qualifying activities. The Company’s strategy is to invest in well located, real estate assets in the established and proven markets of central Birmingham and the Midlands. Real estate assets have income and capital growth potential, realisable through active portfolio management, refurbishment, change of use and lettings. The portfolio has no material reliance on a single asset or occupier. REI Plc is managed by a highly experienced property team with over 100 years of combined experience of operating in the Midlands property market across all sectors. The Company aims to deliver capital growth and income enhancement from its assets with the view to implementing a progressive dividend policy. 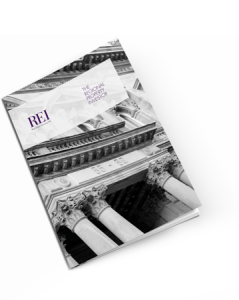 REI has consistently delivered on its promises, driven shareholder value through having a clear strategy and unrivalled local knowledge in their patch.